Our recent project took us to Mercer Island, a beautiful town outside of Seattle. Our client was doing a big remodel and enlisted us to help with all of the finishes and the furniture in several spaces. Last week we showed you the guest bathroom, and yesterday was the webisode. I mean, look at that view! Our client's personal style is quite minimal and she loves black and white, so we ran with it. Even with a few SM signatures evident, our projects span a wide range of styles, and this one feels uniquely special. Another interesting thing about this project is that we did the entire thing remotely up until the install! The exterior has great shingles and a more traditional style which acts as a great counterpoint to the minimal interior. Upon entering, you're greeted by this really great drum shade with metal detailing. We've used this light in entries, kitchens, and bedrooms! 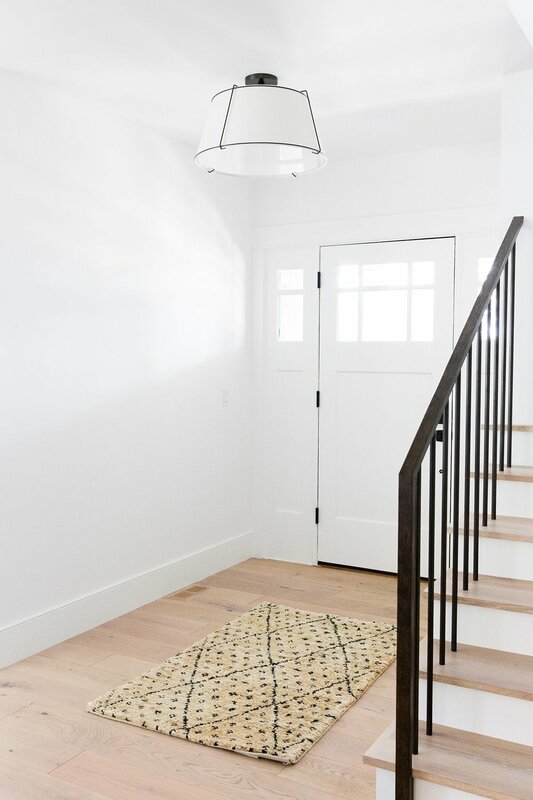 We're loving the custom staircase paired with a cool, textural rug. Because there was little room for furniture, the pile on the rug adds a lot to the small space. Our clients artwork is by Tyler Huntzinger and we grounded it with a leather bench vintage textiles. 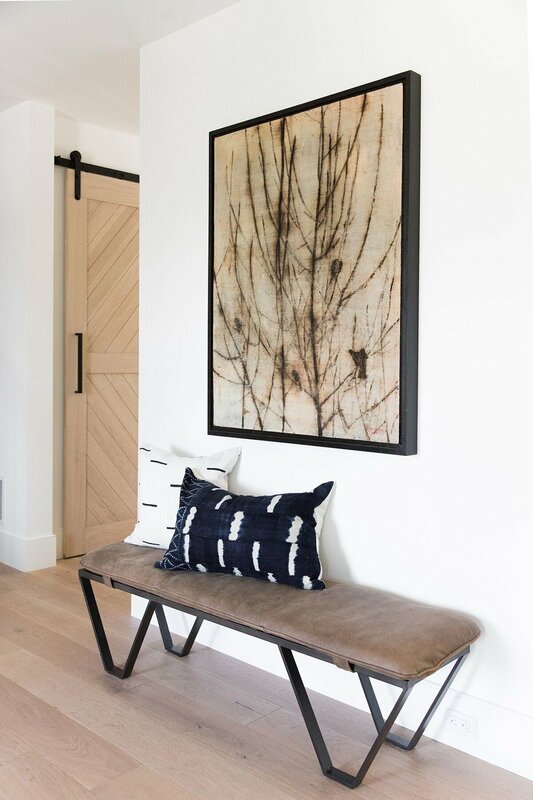 If you have a focal wall you can either work with a console or bench, and here our client wanted the functionality of a bench, so we chose this one because it has amazing leather and metal details. One of the first things you notice when you walk in is the custom plaster fireplace flanked by window seats. They’re great because they provide extra seating and have bonus storage below. The mesh cabinets hide media components, cords, etc. We added sconces on each side for balance and bonus lighting. It makes the space feel clean, without feeling empty! 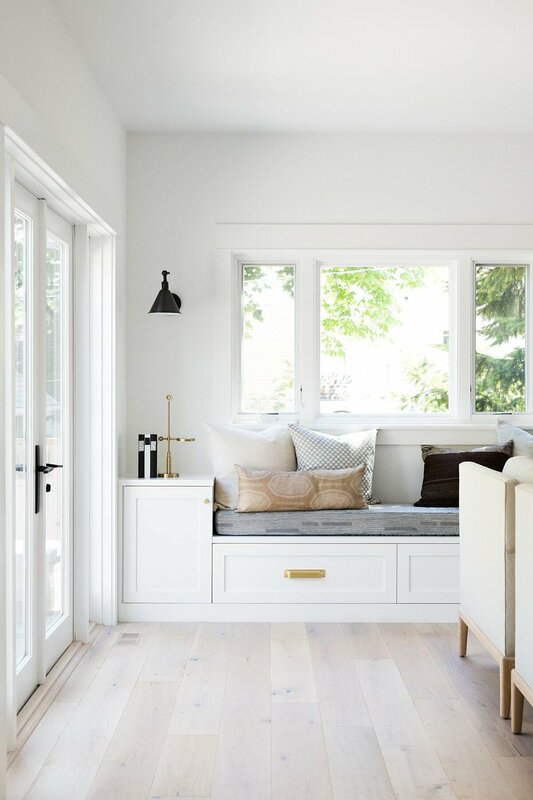 Sure, the lines in the space are clean and minimal, but layers of neutral textiles keep it feeling anything but cold. 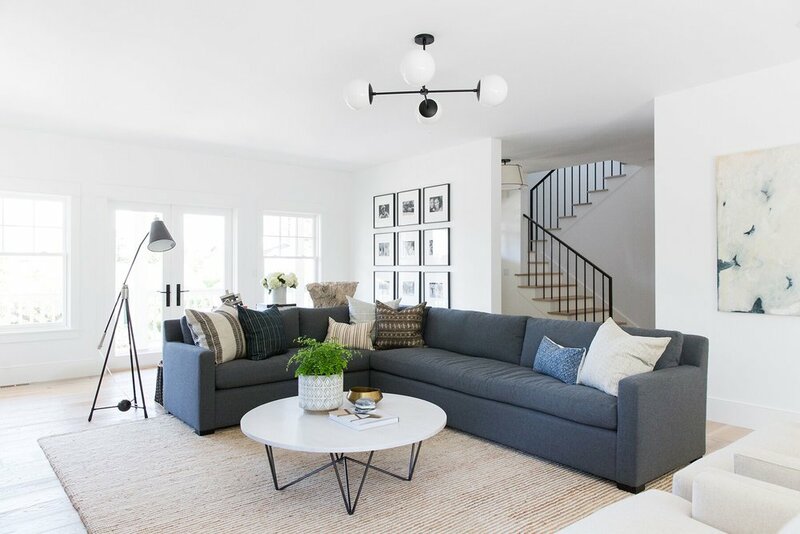 A sectional was a must-have from our client and we went through a lot of different options and finally landed on this beautiful charcoal gray piece. The light linen on the custom chairs provides a light balance to the gray. We made a conscious effort when designing to keep both the colors and patterns subtle throughout. The jute rug has a natural, organic vibe with thin stripes for interest. 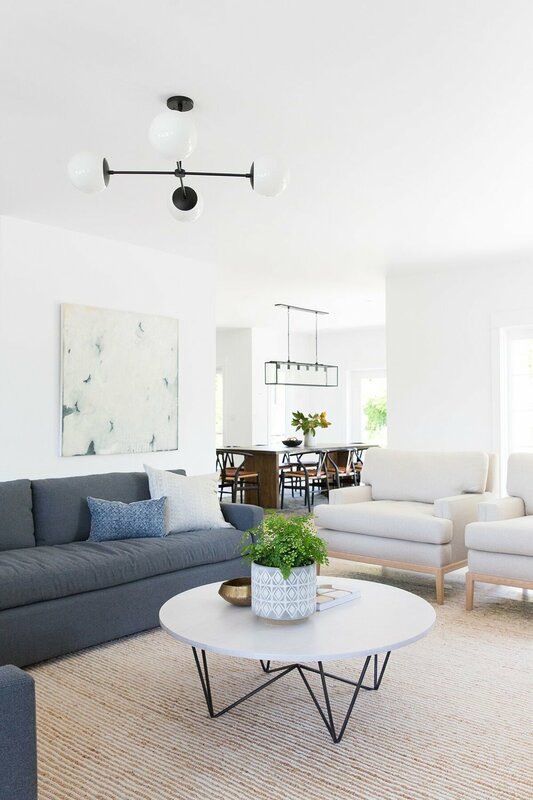 We balanced the black accents throughout the room, from the coffee table to the lighting (floor lamp, overhead lighting, and sconces). 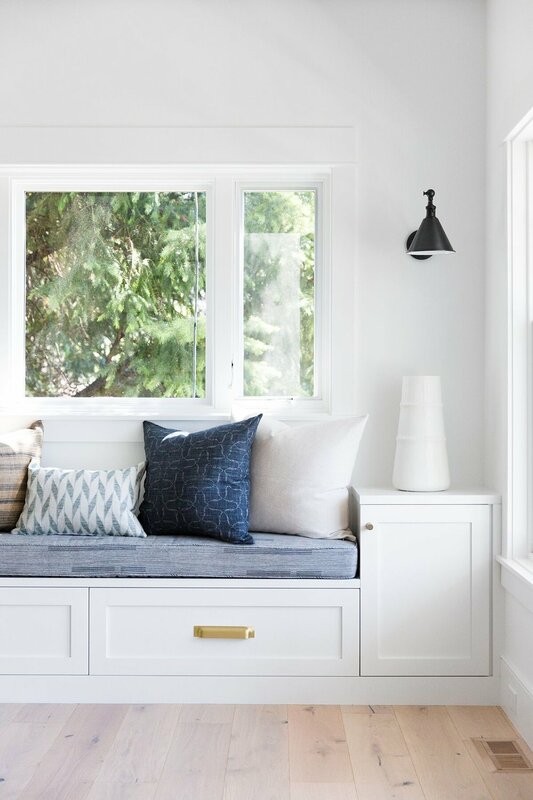 When we first started working on the layout of the space, our client knew they wanted a fireplace with window seats on either side, but the rest of it was up to us! 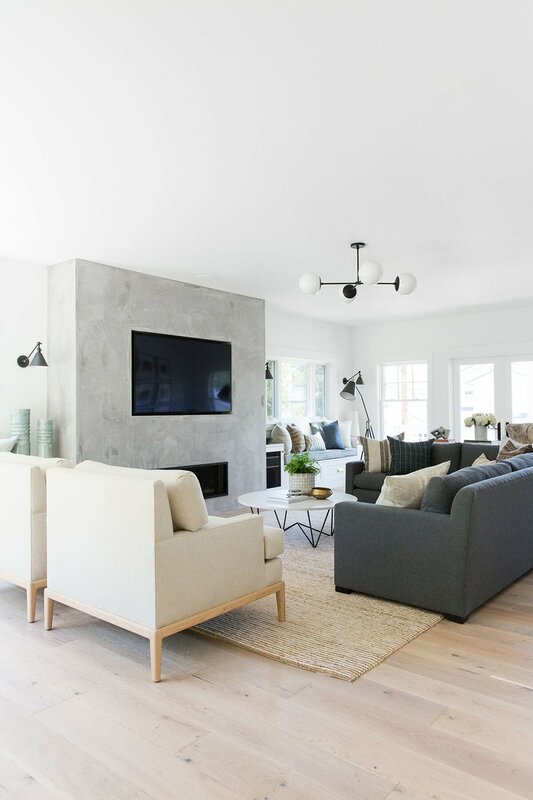 The gray plaster fireplace is the perfect statement agains the white walls. The shape of our ribbed vases makes them great stand alone pieces. They also look amazing filled with greenery or branches! Redmodel work by Gallagher Construction & Development.